Pregnancy brings on a lot of new experiences for women. An unbreakable, unconditional love, the feeling of being kicked from the inside, and for some reason...people you barely know asking very personal questions and/or making insensitive comments. It's important to realize MOST of these people are not ill intentioned. I guess they feel that since you're showing, you should also be telling. To make sure you don't end up being a story the mommy-to-be tells later on, here are a few things NEVER to say to a pregnant woman. 1. Everyone knows (or everyone SHOULD know) if a woman hasn't told you she's pregnant... don't assume she is. The worst reply to "when are you due?" is "I'm not pregnant..."
2. "You're HUGE!!! Are you sure there isn't more than one baby in there?!?!" Wow...thanks. 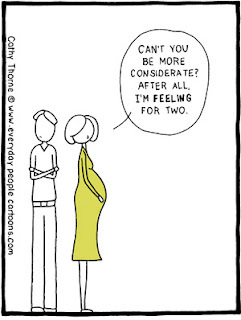 (I actually had this said to me multiple times during my pregnancy by different people). Most women don't like feeling abnormally big... never mind being told they are. Yes, even during pregnancy. Pregnant women are usually already a little self-conscious about their expanding figure. There is no need to reinforce that. Instead try "Wow, you look really beautiful today! How far along are you?" 3. "Were you trying?" Yep, I had that one asked too. Along with "How long were you trying before you got pregnant?" 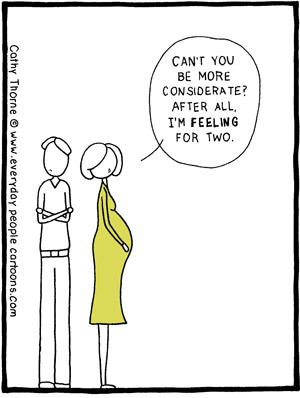 Now if you are very close to someone and you are trying to get pregnant it's ok to ask. I didn't care if my close friends asked, but if an acquaintance asked I would feel uncomfortable talking to them about something so personal. 4. Touching the belly. This one isn't really saying anything....actually it's the lack thereof. Don't just run up and touch a pregnant woman's stomach. If you wouldn't feel comfortable running up and hugging her out of the blue, why would you feel comfortable rubbing her now? Again, if you're family or close friends it most likely is ok. But I still think it's polite to ASK. At least that way the mommy-to-be has a heads up that you will be touching her. 5. "You're really hormonal/emotional right now" And you just made everything worse. It's like someone telling you to "calm down" when you're really angry. She may be acting completely irrational and getting upset over nothing but cut the woman some slack! Her body is putting her through an emotional (and physical) roller coaster. She is aware. There's no need to be rude and point it out. Most importantly just be sensitive. A woman goes through a lot during pregnancy. And while it is exciting and joyous, it can also be very scary to feel so vulnerable and to have so many changes at once. She needs you to tell her she's pretty and ask if she needs help with anything. If you wouldn't say it to her, or ask her if she wasn't pregnant... it's probably best to be on the safe side and not say it while she's pregnant either. Thanks for sharing about things never to say To a pregnant mommy. I think that all the tips are really important for all of pregnancy women. My wife also pregnant so it`s also important for him I hope all tips are maintains my wife. If you want to know about this subject details you can follow this article.